Every two years, USDEC leads a “mission” to a key export market. In April, four of our mission farmers took the stage at the U.S. Dairy Business Conference in Singapore. Their stories prompted gasps of delight, ranking No. 1 in a post-conference survey. We wanted to capture them for broader industry usage. Thus, this four-part video series conveying the care that goes into U.S. dairy products, beginning with our farmers. As a dairy farmer, it’s important for me to act with the highest integrity toward the people in my community—and that includes my global community. It starts on my farm in southwest Pennsylvania. The land is very hilly, with lots of trees. Because of the hilly contour, I have to be conscious of environmental issues and do whatever I can to prevent runoff from the dairy. The land is contoured and liquid manure is stored in earthen dams until the nutrients are ready to be used on the land. The way I look at it, I am partnering with the environment and my neighbors—not just in my neck of the woods, but around the world. Feed storage. Everything is run through silos to get the best quality feed. The feed is stringently tested before it is fed to the cows. Quality is crucial for good digestion and good milk production. Milk handling. Milk from cows is never exposed to the air. It is sealed and properly cooled all the way. I get it down to 38 degrees F as quickly as possible―within five minutes of the time it leaves the udder. Food safety is very important to me. Consumers can be confident that my products are the best available. I love talking to consumers about the wholesomeness and quality of milk. Some people around the world might think all Americans are rich. But I can tell you that’s not true. That’s why I work with other dairy farmers to supply milk to needy people through food banks. 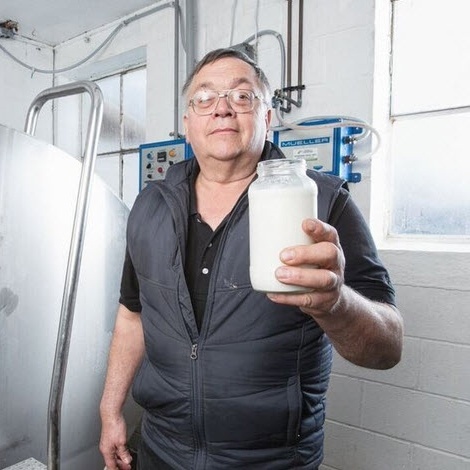 The dairy promotion program in Pennsylvania, which I chair, works with the state department of agriculture, corporations and grocery stores to get milk into food banks through donations, grants and vouchers. I have three children. My son, Aaron, helps me on the farm. My two daughters, Ronna and Katie, are employed out-of-state. My wife, Carol, and I have been married for nearly 20 years. I am involved in a number of dairy organizations that provide me with a national and global perspective. My presence on this trip illustrates my desire to get to know you and your needs. Animal Care: Kima Simonson; Deer Park, Wash. The Environment: Harold Shaulis; Somerset, Pa. Relationships: Renae De Jager; Chowchilla, Calif.
Want to republish this post?